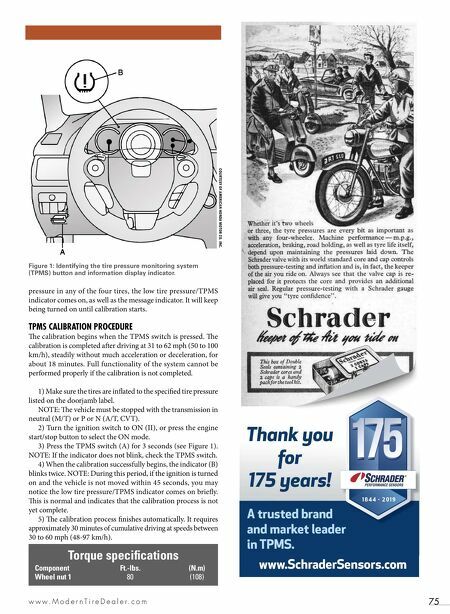 75 w w w . M o d e r n T i r e D e a l e r . c o m pressure in any of the four tires, the low tire pressure/TPMS indicator comes on, as well as the message indicator. It will keep being turned on until calibration starts. TPMS CALIBRATION PROCEDURE e calibration begins when the TPMS switch is pressed. e calibration is completed aer driving at 31 to 62 mph (50 to 100 km/h), steadily without much acceleration or deceleration, for about 18 minutes. Full functionality of the system cannot be performed properly if the calibration is not completed. 1) Make sure the tires are inflated to the specified tire pressure listed on the doorjamb label. NOTE: e vehicle must be stopped with the transmission in neutral (M/T) or P or N (A/T, CVT). 2) Turn the ignition switch to ON (II), or press the engine start/stop button to select the ON mode. 3) Press the TPMS switch (A) for 3 seconds (see Figure 1). NOTE: If the indicator does not blink, check the TPMS switch. 4) When the calibration successfully begins, the indicator (B) blinks twice. 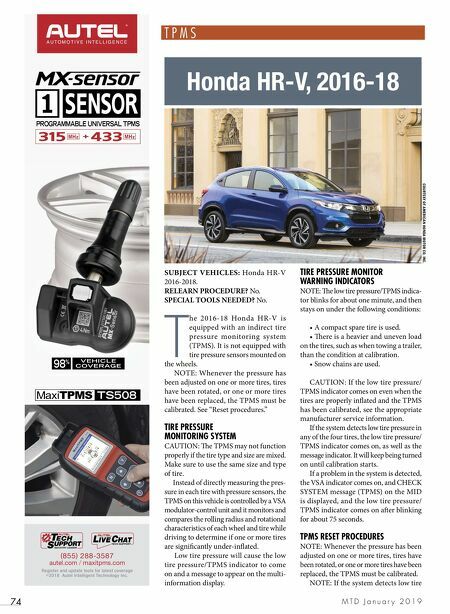 NOTE: During this period, if the ignition is turned on and the vehicle is not moved within 45 seconds, you may notice the low tire pressure/TPMS indicator comes on briefly. is is normal and indicates that the calibration process is not yet complete. 5) e calibration process finishes automatically. It requires approximately 30 minutes of cumulative driving at speeds between 30 to 60 mph (48-97 km/h). Torque specifications Component Ft.-lbs. (N.m) Wheel nut 1 80 (108) Figure 1: Identifying the tire pressure monitoring system (TPMS) button and information display indicator. COURTESY OF AMERICAN HONDA MOTOR CO. INC.